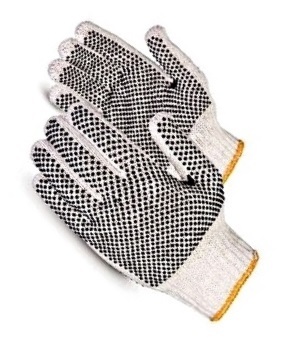 PRODUCT: Heavy Duty Natural Cotton String Knit Work Gloves with PVC Dots on BOTH sides (reversible glove). Large Size. 1-Pair. Price/Pair. Heavy Duty Knit Cotton Gloves. PVC Rubber Grip Dots for exceptional grip. Reversible, Dots on both sides, so wear is doubled. Knit cotton breathes for extended use and in hot climates. These are our warehouse workers favorites.